Spring is coming, and though I’m happy the winter is ending in terms of weather, I also feel a little sad My prime seasons for writing are winding down and giving way to the seasons of editing. Years ago, I read in one of Natalie Goldman’s books (possibly Writing Down the Bones) about identifying the ebb and flow of our creative process (and I still think of it in terms of fertile and fallow seasons) and saw a cycle that is very similar to my own. This student wrote for five to six months and spent the rest of the year speaking, teaching, promoting, and filling up the writing well. I felt less crazy and lazy after reading that. Most writers work successfully year-round and produce words without trouble no matter the calendar. Some of us definitely see an uptick in production and creativity in a specific season or two throughout the year. The comments on the post mentioned above also included at least one writer who prefers fall but starts new novels in the spring. For those who know me well, they know any conversation about the creative process has my full attention. Fascinating stuff, isn’t it? I work best from mid-fall to early spring My brain is just more “awake” during that time of year. I will know by the end of 2014 if that translates into my word counts as I’m actually keeping track for a change. How do you select a season for a story? Twice I’ve chosen summer, which is my least favorite season of the year. I’d love to know why. Does your go-to season for stories match or contrast your personal favorite page on the calendar? How about you? 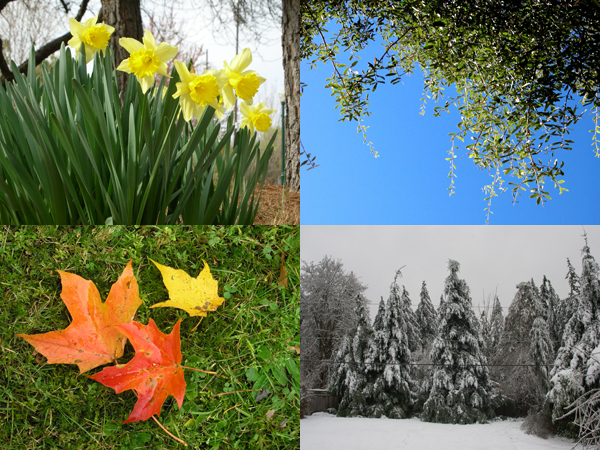 What is your favorite season? During which season are you most likely to start new projects? Are they the same? This entry was posted in Creativity, Writing Process and tagged Creative Process, Robyn LaRue, Writing Process. Bookmark the permalink. I enjoy all four seasons, so that never influences what time of it is for my character. I feel like the story dictates the season(s). My latest book is about an eleven-year-old homeless girl. Since she was battling the mean streets anyway, it just made sense to have it be during the harsh winter. I’ll have to give this more thought. Good stuff, Robyn. Thanks! I started this new book last summer, and did a majority of the writing in November. (NaNo, of course). I tend to start new projects in the summer, because i have more time. I never really thought about what season I write the most, except I write the least during winter, only because down here in Florida, especially after January, we’re packed with people and everything, even just driving down the road, takes longer. Love NaNo 🙂 I can imagine things get pretty crowded in Florida for at least half the year.